real perpetual motion machine: Here are revolutionary solutions to energy production ! I think I have 2 good news for people on the planet. It's been impossible like alchemy for Man to break " the law of conservation of energy " from time immemorial. But I think that I am the first man around the globe who have broken the law. It may be the holy grail of energy production. Please review the explanation of the solution which may help solve the global energy crisis without a fixed idea or stereotypes about energy production. I think experts of mechanical engineering can review the solution whether it may be possible or not in a few hours or in a few days. So, I dare to let you know that here is a revolutionary solution or breakthrough to energy production. Please feel free to ask me about what is not clear about the explanation or anything difficult to understand. Impossible ? Please tell me why . Any errors ? or Any questions ? Don't hesitate to ask me about them. I strongly think that my invention can produce about 1.5 or 2 times output torque than the input torque of the primemover such as a motor. ( preferably at the low rpm ). For example , the output of an electric motor or an internal combustion engine is 100 kw, If we adopt the solution to the electric motor or Diesel engine, the output of each of them may be about 200[kw]. How about in case of the output of 1,000kw or 10,000 kw ? Of course, those may also be possible to double it up to 2,000 kw or 20,000 kw. If it is possible , it may save the world from fossil energy shortage crisis, environmental problems and global warming. And Man may also live without nuclear power plant. In other words, we don't need crude oil, natural gas, coal , renewable energies such as wind power and solar power and nuclear power any more in the near future. And If you can adopt the solution to EV's or PHEV, your EV's like GM's Vault can run nearly forever. Explanation of the Solution ! The invention is basically based on "Pascal's law" and an application of it. The law is defined as follows. Pascal's law : The principle that external static pressure exerted on a fluid is distributed evenly throughout the fluid. Pascal's law of fluid pressures - pressure applied anywhere to a body of fluid causes a force to be transmitted equally in all directions; the force acts at right angles to any surface in contact with the fluid; "the hydraulic press is an application of Pascal's law"
In the Figure 1 , there are the two same weights of 100 N ( 13 and 17 ) about the left end of the surface of the two pistons ( 14 and 18 ). Wherever those each weights on the surface of the two pistons are , the pressure exerted on a fluid such as oil on the inner surface of each cylinders is all the same. So, those two pistons( 14 and 18 ) can not move downwards or upwards. In the Fig 2, there are also the same weights about the left end of the surface of the two pistons( 24 and 28 ). In addition, the cross-section area of the those two pistons are all the same. Even though the ditance or radius from the center of the revolving body( 31 ) to the weight( 23 ) is twice, the revolving body ( 31 ) won't turn or rotate. That's why the pressure exerted on a fluid such as oil in the left and left cylinderis all the same ( or all the same force ). 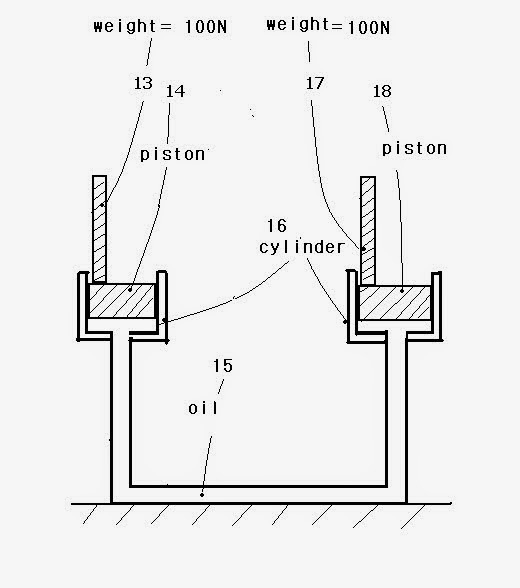 In other words, that's why the torque created by the force or pressure by each piston is all the same. Even though the distance or radius is twice, the torque created by the weight( 13 ) can not be twice in Fig 2. Now, here is a surprise ! The Fig 3 is an application of the concept of the Fig 2. 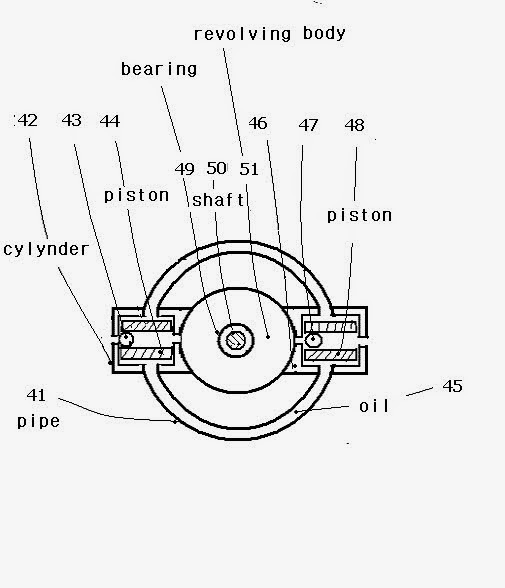 For example, when you turn on the motor( 39 ) to create 100 N of force at the end of the arm( 39-1 ), 100 N of force is put on the surface of the piston( 37-1 ), and the same force will produce on the surface of the piston( 37-2 ). The radius of the arm( 39-1 ) of the motor( 39 ) is 0.1m long and the radius of the arm of the generator( 34 ) is 0.2 m long. To calculate the torque, you just multiply the force by the distance from the center. In this case, if the arm of the motor( 39 ) is 0.1 meter long, and the motor creates 100 Newtons of force , the motor is generating the torque of 10[ Nm ]. ( T = f * r = 100 * 0.1 = 10[ Nm ] ). 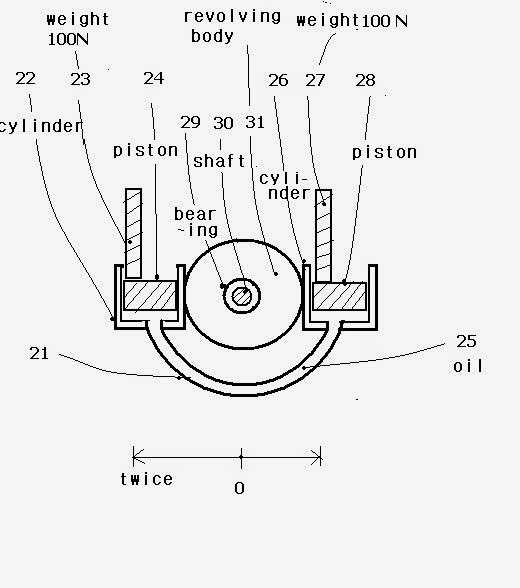 But, the torque created on the surface of piston( 37-2 ) will be 20[Nm]. ( T = f * r = 100 * 0.2 = 20[ Nm ] ). So, the torque of 20 N will be transmitted to the arm of the generator( 34 ) and the generator will generate twice as much as the output written on the nameplate of the motor( 39 ). Power is defined as follows ; P = omega ( or rpm ) * torque[w]. From the equation, if the torque can be twice, power can also be twice. For example, the output written on the nameplate of 10 kw can be about 20 kw. 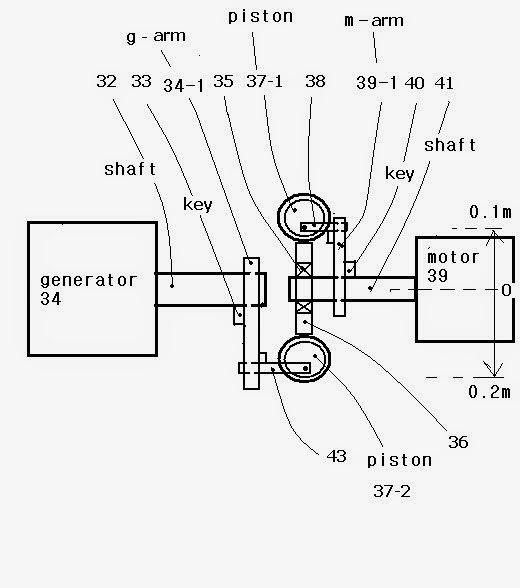 Of cause, each rpm of the motor and the generator is all the same. Fig 4 shows that the solution unit can be installed at the rear end of the transmission of a car to rotate counter-clockwise or clockwise. Thanks a lot for your reading.